The Foundations of Computational Mathematics meetings are a platform for cross-fertilisation between numerical analysis, mathematics and computer science. 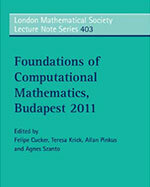 This volume is a collection of articles based on plenary presentations, given at the 2011 meeting, by some of the world's foremost authorities in computational mathematics. The topics covered reflect the breadth of research within the area as well as the richness of interactions between seemingly unrelated branches of pure and applied mathematics. As a result this volume will be of interest to researchers in the field of computational mathematics and also to non-experts who wish to gain some insight into the state of the art in this active and significant field. Chapters based on plenary talks given by world authorities. Reflects the richness and diversity of computational mathematics. Written to appeal to non-experts and to specialists. The computer algebra system Maple has been used in the text to compute solutions.